We’d love your help. Let us know what’s wrong with this preview of Kilala Princess by Rika Tanaka. To ask other readers questions about Kilala Princess, please sign up. At first, it's quite odd to read this manga with Disney characters included; in this particular volume, it is Snow White and the seven dwarfs/dwarves that Kilala and Rei met. I love this manga because I grew up watching the Disney Princesses and I'm looking forward on reading the succeeding volumes. Thank you to the publisher for sending me a free copy of this manga through e-mail. Ok, this is absolutely adorable and I loved every minute. You honestly cannot go wrong with a Disney manga that lets you revisit all the princesses and their stories! I highly recommend this and I'm looking forward to volume two! A story with Disney Princesses in it? So Kilala is a big Disney fan, and a crazy schoolgirl who loves causing trouble. There's a princess competition at her school, and her good friend Erica is the best candidate. After Erica is kidnapped, Kilala and Rei, a boy who's looking for a princess, work together to find her, using the powers of the tiara of the seventh princess. Along the way, they encounter Snow White and the Seven Dwarfs, who are very eager to help. I enjoyed reading this manga, it was really cute and God knows how much I love the Disney Princesses! Also, Kilala is adorable, I liked how the author included Snow White and the dwarfs, it didn't feel forced or like they were out of place, it was done very nicely. This review has been hidden because it contains spoilers. To view it, click here. Diese Review gilt für die gesamte Serie. Kilala Princess war einer der ersten Mangas, die es in meiner Kindheit in mein Bücherregal schafften. Schon damals (bevor ich überhaupt von der Existenz der "Kingdom Hearts" Spiele wusste) liebte ich die Idee einer Protagonistin, die, die Disney Welten bereist und dort mit ihren Freunden Abenteuer erlebt. Der Zeichenstil ist einfach umwerfend und Kilala ist eine wahrhaftig tolle Protagonistin, die mir aufgrund ihrer schusseligen und doch liebenswerten Art Diese Review gilt für die gesamte Serie. Kilala Princess war einer der ersten Mangas, die es in meiner Kindheit in mein Bücherregal schafften. Schon damals (bevor ich überhaupt von der Existenz der "Kingdom Hearts" Spiele wusste) liebte ich die Idee einer Protagonistin, die, die Disney Welten bereist und dort mit ihren Freunden Abenteuer erlebt. Der Zeichenstil ist einfach umwerfend und Kilala ist eine wahrhaftig tolle Protagonistin, die mir aufgrund ihrer schusseligen und doch liebenswerten Art von Band 1 ab ins Herz gewachsen ist. Ich würde die Reihe jedem Disney-Fan empfehlen. Ein kleiner Kritikpunkt jedoch ist und bleibt für mich die Rivalität zwischen Kilala und Silvia (die ab Band 4 beginnt). Auch wenn die beiden letztlich lernen einander zu akzeptieren und Silvia einsehen muss, dass Rei sich für Kilala entschieden hat - fand ich das Drama einfach nur überflüssig. Zumal sich Rei und Kilala in Band 3 bereits geküsst haben. Man hätte so viel mehr mit Silvias Charakter machen können statt sie nur für dieses unnütze Love Triangle auszunutzen. Denn eigentlich dürfte es jedem Leser schon vor dem Kuss klar gewesen sein, dass Kilala und Rei letztlich ein Paar werden. Silvia hätte beispielsweise einfach Rei's beste Freundin seit Kindheitstagen sein können, die ihm zur Seite stehen will und durch die Kilala auch eventuell mehr über Rei's Charakter erfährt. Die Möglichkeiten erstrecken sich ins Endlose und genau das finde ich auch irgendwie so Schade. Ah the woes of reading this in high school! She looks so childish now! Okay, I'm not sure if that's Kilala Princess came to be, but this manga feels very much like an attempt to create a Kingdom Hearts doppelganger for the female audience. 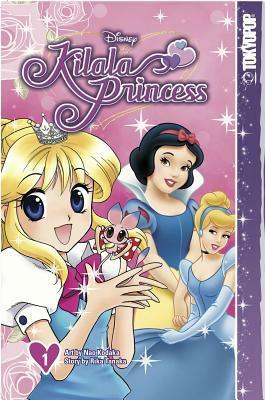 Kilala Princess stars the titular character, Kilala, as she travels through a doorway to different Disney-princess themed worlds, searching for the legendary Seventh Princess with cute boy Rei. She teams up with Disney characters (Snow White and friends in volume 1) to try and save her friends. Not that I'm knocking the KH similarities. It's a great formula, having a new character interact with the different stories and characters we're familiar with. In fact, that formua, much like the Disney Princess Formula, is what makes this manga good. The problem is really that, at least so far, that formula isn't as well-implemented as it was in KH. The characters are just tropes without much else there to round them out. Volume one suffers from pacing problems galore. There's a bad case of instalove. There are details that are big deals in the book that are quickly dropped and forgotten. The seventh princess was obvious from the moment the phrase was uttered, and I will be shocked if I'm wrong. Kilala explains the relevant plot points of Snow White to Rei, who was apparently living under a rock before he appeared in this volume. At least the art's nice. It's a mash up of Disney-style and anime style that actually fits together quite nicely. It's more shoujo-style than the Kingdom Hearts manga and less cartoony. Kilala and friends slip into the Disney stories and don't look at all out of place standing next to Snow White, who looks just like her updated "Disney Princess" artwork (Disney's more modern representations). You can tell Kodaka-sensei worked very hard to mimic Disney while still keeping Kilala and company her own. That's not to say there's nothing good about the story itself. The general plot is pretty good but for the fact it's really rushed. The general plot of "Snow White World" is pretty good and doesn't just rehash the movie's plot, instead opting for a "the queen's not really dead and wants revenge" kind of subplot. Tanaka-sensei doesn't pull any punches either. Stakes are pretty high for an all-ages shoujo manga. Characters get hurt, people get shot at. I'm amazed that Disney let them get away with so much. Sadly, though, I can't really say I'd recommend this to anyone based on the first volume alone. So far, this Shoujo attempt at the Kingdom Hearts formula is plagued with too many problems. The good parts are enough for me to give the second volume a try (especially since my library has a copy), so that opinion may change. A whole new world of adventure and romance! This book is basically my childhood dream in print form. Getting to go on an adventure filled with all of my favorite Disney characters not to mention getting the chance to become a real princess myself. This book will definitely appeal to the younger audience and to those of us who are still children at heart. There was tons of whimsy and a bit of mystery, but what I loved the most was the spunky heroine and her banter with the kind and yet annoyingly c A whole new world of adventure and romance! There was tons of whimsy and a bit of mystery, but what I loved the most was the spunky heroine and her banter with the kind and yet annoyingly charming Rei. These two really made the entire story. Kilala is sweet, fun loving, quirky, a bit stubborn, but most of all loyal to the end. She would do anything for her friends and always tries to do the right thing even when it isn’t always the easiest way. She is a great character who would make a great friend. Rei is a bit of a smart aleck, but he knows when to admit he is wrong and sticks up for his friends. This is an exciting adventure that I recommend to anyone who enjoys fairytales and/or Disney. I think you mean- Would you like to read Kingdom Hearts for Little Girls? WOW. THAT WAS REALLY CUTE. AND REALLY SHORT. I personally don't find it that odd because I've read plenty of manga where young girls have traveled to distant lands and saved the day, but I mean... it was super rushed. I guess that's because it's for LITTLE KIDS. I couldn't help myself though. THAT ART. This book was super generic... I liked the idea of having Snow White as a character outside her story... but the main character Kilala gives me a headache. I saw this series on-line a while ago and was curious, but Tokyopop, the publisher, went out of business years ago. It wasn’t until I wrote this review that I learned that they’re back in business and seem to still have the rights to this series. Anyway, when I saw copies of the first three volumes in a used bookstore, I picked them up. Reviewing first two volumes here. It’s exactly what you’d expect from a shojo manga/Disney Princess mash-up. The storyline is pretty typical manga, about a likabl I saw this series on-line a while ago and was curious, but Tokyopop, the publisher, went out of business years ago. It wasn’t until I wrote this review that I learned that they’re back in business and seem to still have the rights to this series. Anyway, when I saw copies of the first three volumes in a used bookstore, I picked them up. Reviewing first two volumes here. It’s exactly what you’d expect from a shojo manga/Disney Princess mash-up. The storyline is pretty typical manga, about a likable school girl named Kilala who loves Disney and dreams of meeting her Prince Charming. A couple of attractive guys from another world show up at her house carrying a tiara in search of a mystery princess destined to save their country. They don’t determine it’s her (why they came to her house and stay there is never explained, nor is why the hero was sleeping in her yard—this seems to just be so she could try to kiss him Sleeping Beauty-style). She puts on the tiara and is able to open a magic door that transports them to Snow White’s world, yet they still don’t think she’s the princess. Presumably, as the series continues, she’ll visit other princesses. She thinks her best friend, who wins a school contest to become princess, is the princess. In volume two, she gets a missing gem for the tiara from Snow White, which makes it feel like this is based on a video game, even though it’s not, as far as I know. Presumably, she collects a different colored gem from each princess she meets and I assume when complete she’ll have the power to save the guys’ world. The illustration of the crown has seven spots for gems, and six Disney Princesses are featured in the front matter: Snow White, Cinderella, Sleeping Beauty, Belle, Jasmine and Ariel. The missing princess is called the “seventh princess.” Who could it be...? Storyline and the stock characters is probably a 2.5, but I’m bumping up my rating based on the art, which is well done. The manga style is good shojo art, and the Disney art is true to the original. It’s interesting to see the two styles combined. 'Kilala Princess: Volume 1' by Rika Tanaka and Nao Kodaka is a manga from TOKYOPOP from their Disney line. Other titles I've seen have been adaptations of Disney films. This was was different. Different isn't always a good thing. Kilala is a girl who is obsessed with all things Disney. When she wakes up a handsome prince named Rei, she somehow becomes a princess. She and Rei decide to try to find her friend Erica who has disappeared. They set out on a quest that leads them to the world of Snow Wh 'Kilala Princess: Volume 1' by Rika Tanaka and Nao Kodaka is a manga from TOKYOPOP from their Disney line. Other titles I've seen have been adaptations of Disney films. This was was different. Different isn't always a good thing. Kilala is a girl who is obsessed with all things Disney. When she wakes up a handsome prince named Rei, she somehow becomes a pr‌incess. She and Rei decide to try to find her friend Erica who has disappeared. They set out on a quest that leads them to the world of Snow White and the seven dwarves. Along with the good characters, there are also the bad ones, so the evil queen can't be too far behind. This volume only has Snow White, unless you count the random drawings of other Disney princesses that show up inline with the story. The art is fine, but the story is just strange. It also doesn't conclude here. There is a Disney princess in the volume for some of the story, but it hardly makes sense why she would be here. Maybe in a future volume, we'll find out Kilala has had a breakdown and all these fantasy creatures are only in her mind. This is a cute series and I adore that it brings in classic Disney Princesses and does have good messages for any girl or even boy growing up. It is important to believe in yourselves, make friends that are important to you, don't judge a book by it's cover or a person, and kindness will be rewarded. However, there are also some down points to the series. The first being it is extremely rushed from volume 3-5. Only Snow White and Ariel get what feel like fully developed stories with good villain This is a cute series and I adore that it brings in classic Disney Princesses and does have good messages for any girl or even boy growing up. It is important to believe in yourselves, make friends that are important to you, don't judge a book by it's cover or a person, and kindness will be rewarded. However, there are also some down points to the series. The first being it is extremely rushed from volume 3-5. Only Snow White and Ariel get what feel like fully developed stories with good villain time that made it interesting. But then all the others are really short and fly by, i felt Belle and Aurora hardly had any face time. The evil stepmother and even Maleficent are hardly involved in their stories which is a shame, they really could cause good chaos. I also feel like there is a plot hole but its a spoiler so I wont get into it. This review is for the whole series! Read at your own risk! Kilala Princess is a Manga series about a girl who loves the Disney Princesses and dreams of one day becoming a princess herself. One day on her way home from school she stumbles upon a sleeping boy who won't wake up, so she kisses him, just like Prince Philip kisses Sleeping Beauty. As he awakens, a whole tale unfolds about how he's a Prince searching for the 7th Princess to save his country. It is rumored that the 7th Princess will be revealed when all 7 of the jewels on the Prince's tiara are Kilala Princess is a Manga series about a girl who loves the Disney Princesses and dreams of one day becoming a princess herself. One day on her way home from school she stumbles upon a sleeping boy who won't wake up, so she kisses him, just like Prince Philip kisses Sleeping Beauty. As he awakens, a whole tale unfolds about how he's a Prince searching for the 7th Princess to save his country. It is rumored that the 7th Princess will be revealed when all 7 of the jewels on the Prince's tiara are returned. In order to get them, they have to visit 6 of the original Disney Princesses and rescue them! I am rereading this series from the beginning since I never did finish it. It is basically almost sort of like a shojo version of Kingdom Hearts. So if you're a fan of Kingdom Hearts you're going to love this series. But the randomly thrown in character art and author's notes throughout were a bit odd. Cute. The art is absolutely stunning. Disney anime. How did I not know about this sooner?!?! 3.5 Stars it is a little out there but cute and I enjoyed it. Excellent plot which flows well with Disney classics. I didn't even know these existed until I saw them on my library's web page. I love Disney princesses, I love original content, I love this series. Super cute start to the series. Kilala is a lovable character who has the cutest pet. They did an excellent job miking in the Disney princesses also.